Lemon cucumbers are cute, round, yellow cucumbers – they just don’t happen to have any lemon flavor which is misleading. I received a huge crop of these from my CSA this year, far more than I could ever eat myself or give away, so I decided to rectify that lemon issue by actually making a pickle that included lemon. 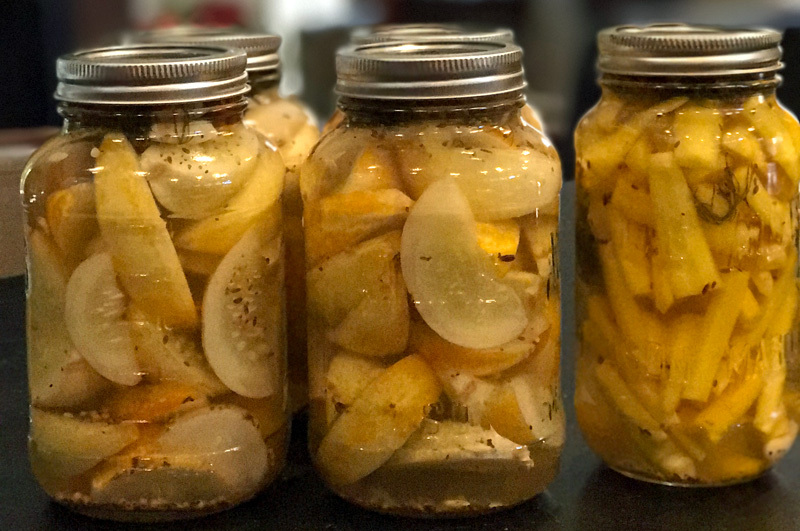 Follow the recipe for the standard pickle brine from my Spicy Classic Dill Pickle recipe, but add some lemon to each jar. Use a vegetable peeler to peel off just the outer layer of zest from a lemon and divided that between the 4 quarts. Squeeze the juice of half a lemon into each jar, and then add the vinegar-salt brine solution. That jar on the right is actually yellow carrots – I had enough brining solution left I went ahead and pickled them too which is a great idea when your harvest is taking over your house!